Filter by gauge Show all gauges 8g 6g 4g 2g 00g/10mm 1/2" 9/16" 5/8" 3/4" 7/8" 1"
Sizes offered: 8g, 6g, 4g, 2g, 0g, 00g/10mm, 1/2", 9/16", 5/8", 3/4", 7/8", 1"
You don't have to like geometry to like these internally threaded Hexa eyelets! They combine everything you love about an eyelet with hexagon shaped flares. 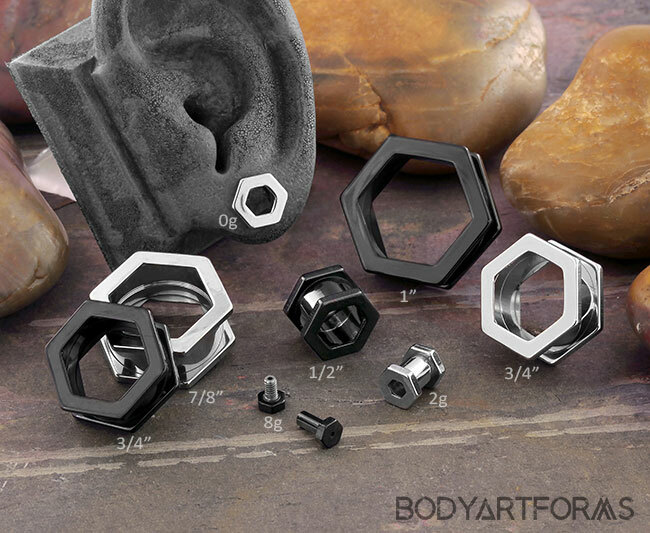 These Hexa eyelets are available in polished stainless steel or black PVD plated stainless steel. All sizes have a wearable area of 1/4"
The overall length measures 3/8"